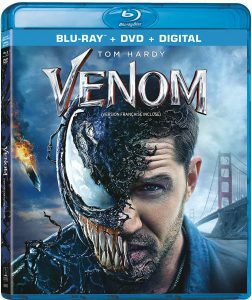 Venom – Investigative reporter Eddie Brock (Tom Hardy) comes into contact with a symbiote creature and later discovers he has developed superpowers. The powers belong to a mysterious voice inside him, and he tells it, if it’s going to stay, it can only hurt bad people. However, he soon finds he has no power to control the beast within, which transforms into a creature that calls itself Venom. Click here to buy the Blu-ray. Hell Fest – On Halloween night, a group of friends attend an amusement park horror show called Hell Fest, where they are stalked by a masked man. Initially convinced this is all part of the scary fun, the friends quickly learn he’s an actual murderer and must escape being slaughtered by him, while the other unsuspecting patrons believe it’s just another spooky scare. What They Had – Bridget (Hilary Swank) returns home when her mother Ruth (Blythe Danner), who suffers from Alzheimer’s, wanders off during a snowstorm. Her brother Nicky (Michael Shannon) doesn’t have the patience to take care of Ruth and resents the responsibility that has been placed on him, believing she should be put in a nursing home instead. His father Burt (Robert Forster) passionately refuses and vows to stay by his wife’s side, no matter what. Click here to buy the Blu-ray. Let the Corpses Tan – In order to prepare for a robbery, crime boss Rhino and his team set up their headquarters in a Mediterranean villa that their friend Luce owns. While there, they find themselves entangled with Luce’s colorful guests, and later complete the robbery but are tracked back to the villa by two policemen. What ensues is an all-day, all-night shootout.